if you think you’d buy a shirt if I made some. Thanks in advance! Can’t wait to hear what you think. Drop me a line via the Contact page. 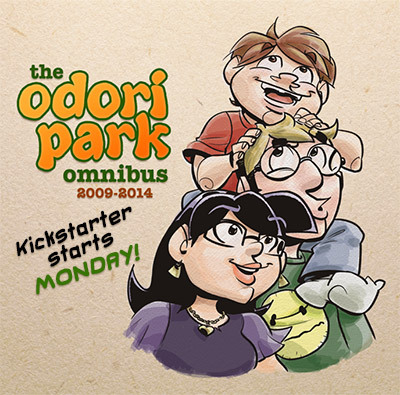 On Monday, April 7th, I’ll be launching my Kickstarter campaign to fund the printing of a brand new book: The Odori Park Omnibus, which will collect all five years of my comic strip in a handsome volume, suitable for giggling, chuckling, and possibly guffawing over. At least, that’s the intent. I’ll need some folks to pledge some money to the campaign, though, and in exchange, get a copy of the new book, and/or any of a number of other cool rewards you can pick. The key to a successful Kickstarter run, as I understand it, is a nice big kick-off, so I want to spread the word about Monday’s launch as far and as wide as possible over the next couple days. If you’re a reader of Odori Park, and you know somebody else who would enjoy my brand of sincere, multi-cultural, geeky comedy, please spread the word about the campaign. I’ll have a link to post on Monday, but in the meantime, you can send them here, with my gratitude! I plan on debuting the book—assuming all goes to plan with printing—at the Maine Comics Arts Festival on May 18th. If you’re planning to attend, and you back the Kickstarter, you may very well wind up being one of the first to get their hands on the Omnibus. And that would make me all kinds of happy—there’s very little I like better about Odori Park than thinking there are other people out there who enjoy it, too.